This awesome offer is back from the Scholastic’s Teacher Store. 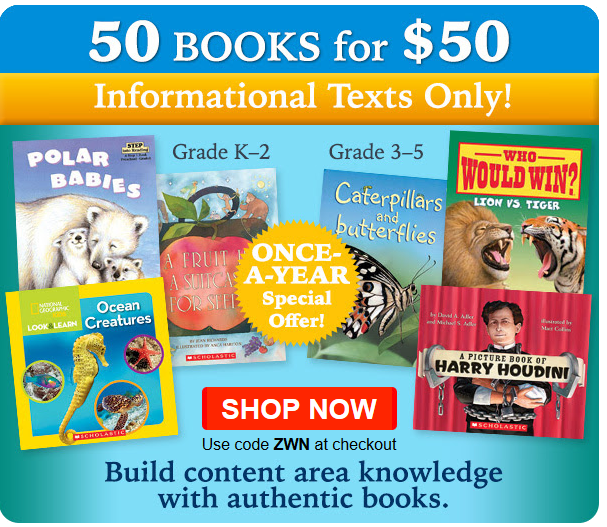 Build your classroom or home-school library with this dynamite offer of 50 books for $50! (Available to teachers and home-schools only) Just use code ZWN at checkout. Shipping has went up on these offers. It added $13.41 for me. This batch will include ALL non-fiction books. The books are random, but they offer a great collection. I’ve ordered with these offers three times before and have never been disappointed. Choose from two different packages: K-2 or 3-5. If you choose to purchase both sets, you’ll get a free woen basket with your order. Offer ends 3/25 or while supplies last. *If you’re a home-school family that has never taken advantage of this offer before, you can expect a phone call to verify.